My recent KB kitchen time was devoted to something a bit unusual - for me. I spent time using up food that was crying for attention, approaching its “best before” time. Squash everywhere – butternut, acorn, delicata and pattypan (of unusual size); zucchini, French butter pears, plums, kale, bananas and more. Waste not, want not. I hate to throw out food staples not used, or cooked food not eaten. So why did I say it is a “bit unusual” for me to use up all that food? Because I tend to cook forward, not backward. Cooking Backward. As described by Donofrio, with this approach to cooking, the ingredients are the starting point, and the cook’s task is figuring out what to do with them. Skill in creative improvisation, or intrepid experimentation rule the day. For those lacking both - and seemingly this includes her mother (Donofrio jokes that her mother is a “To the T” recipe follower) - Donofrio offers her cookbook - organized by vegetable since ingredients are the starting point. Cooking Forward. Donofrio does not use the term, but the implication is that her mom “cooks forward”. Her mom, I am guessing, is my age. I too tend to cook forward – start with recipe, go to store with shopping list, and follow recipe. In cooking forward, the blueprint for an imagined outcome is the starting point. This is not to say that I don’t improvise. I have the confidence to go with the flow, handle mistakes, make substitutions, modify methods – but most of the time the starting point is a recipe guiding my cooking journey. CB:BTB – match ingredients to a recipe, then follow it “By The Book”. In defense of cooking forward – it minimizes wasting food. Every food brought into the kitchen has a known and imminent destiny. In addition to its apocalyptic usefulness, I get the feeling that cooking backward is considered to be more creative, so I feel pressure to say that I can handle cooking backward – especially if I can match ingredients to a recipe. But I know I do not come close to many fellow bloggers who perform magic in the kitchen. One that comes to mind is Ginny from The Spicy Eggplant. She has even blogged about “playing with food”, and I have told her that I think her introduction to cooking would make a great movie! Cooking backward would have ancient roots, and be characteristic of farmers and peasants. It seems like the noble, virtuous way to cook. And yet, there are also early roots to the habit of recipe writing. Wikipedia claims that the oldest cookbook, Apicius, is from 4th / 5th century Rome. Recipes were often closely guarded secrets, as portrayed in the novel by Elle Newark – published as The Chef’s Apprentice (also published as The Book of Holy Mischief). It is set in Renaissance Venice – I am a sucker for any fiction set in Venice. I dare you to name a title I haven’t read [wink]. Is cooking backwards or forwards a style preference or an age-related thing? Is it nature or nurture? I should be good at backward cooking – only two generations removed from peasants and farmers. I grew up in a house where we made sausages and smoked them; where preserving was routine – pickles, pears, peaches, cauliflower, tomato sauce, and plum butter (aka – lekvar). I treasure all the mason jars, but am not doing much to fill them. 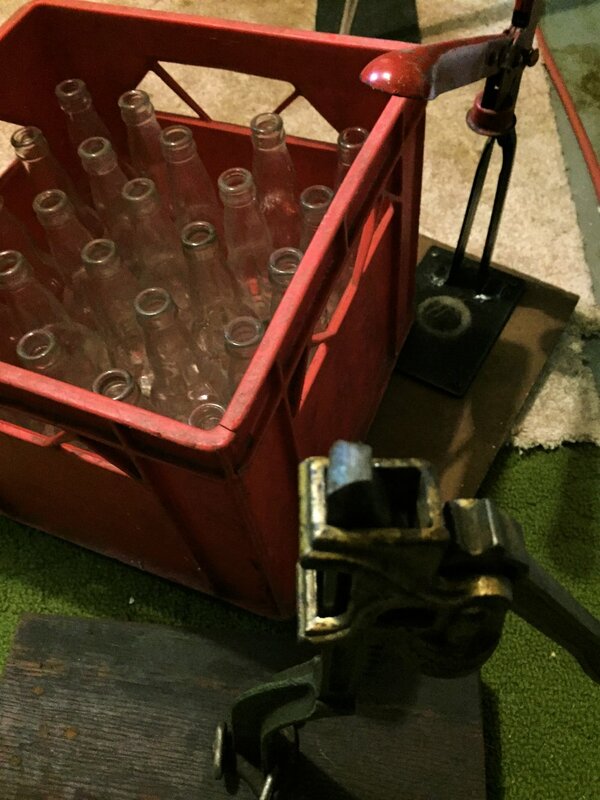 Mom's basement: Capping gadgets and old beer bottles used for bottling tomato sauce. True. Minutes after finishing this post, nice farmer delivered more squash!! Am not getting ahead. Backwards it is!! On the other hand, my preference for using recipes may be linked to a long history of following instructions – I think, I hope, not in a bad way. I grew up watching my Dad assemble Heathkits. I assembled models – the largest being the USS Enterprise – the aircraft carrier, not the Starship. I made my own clothes – from patterns. I did paint by number. I studied piano following the Conservatory method. The pay-off today? I LOVE assembling IKEA furniture! And yet… something about all this suddenly sounds a bit unsettling, perhaps even psychologically unhealthy and restrictive. Geesh – maybe there’s therapy for these kinds of childhood experiences. Sign me up for “Fun 101”! Or… lead me to a kitchen – forward or backward. BTW, in case you’re interested, so far my Cooking Backward session yielded the following results: (Curry) Butternut Squash Pear Soup (I played with a recipe from a talented fellow blogger - Maria of She Loves Biscotti - and used up two ingredients! ), and Banana Bread, Party Plum Cake, Zucchini Bread, and Festive Kale Salad. I am still trying to decide how to use the pattypan. Backward Cooks may be more likely to create and play. We know they blog - and some even get cookbook deals. Thanks in advance to the Forward Cooks who, in search of that perfect tested recipe, might visit this site and leave a “Like”. Click on the word "Comments", below, to share. What style of cook are you? Any recommended Venice books? If you enjoyed this read, please take a second to click on "Like"!